One of the side effects of having immersed myself in the Unpacking Manuel’s project has been the intrusion of the project into my dreams. This is, as most material culture historians will tell you, a normal thing that happens when you are so involved in a project. For the last few weeks, a central feature of my dreams has been the collection of beer cans displayed above the main bar, as has the titular song for this post. To be honest, I’ve been dreading undertaking this part of the catalogue. Large collections of nearly identical object with very little attached information is nearly the thing that nightmares are made from. Specialized monotype collections require a depth of knowledge usually only acquired through years of focus and study. And I will be honest – in the field of can collection, my depth of knowledge is likely on par with a rain puddle on a sidewalk, when what I need is the Marianas Trench. Thus, my dreams have been reminding me of my feelings of inadequacy when faced with such a collection. But if lack of knowledge were a constraint, I would rarely be able to complete a project. So what goes in to finding the needed knowledge for such specialized collections? My first stop, nearly always, is eBay, when it comes to collectable objects. I start with one or more of the objects in question, and run searches for the description. And, nearly inevitably, I will find a seller that lists the item I am searching, and will also include information about a collectors group or club related to the objects. I noticed over and over a reference to “USBC USBC II” or I” in titles or listings for various cans, followed by a pair of two digit numbers. Intrigued, I threw the initialism into a search engine, paired it with the phrase “beer can” and suddenly found myself at the website of the BCCA, or Brewery Collectibles Club of America. Listed on the site were two reference books, United States Beer Cans: The Standard Reference of Flat Tops and Cone Tops, and United States Beer Cans: The Standard Reference of Tab Top Beer Cans. These two volumes are considered the newest standard reference texts for all collectors of “Breweriana” – collectables related to breweries and beers. After a half hearted hopeful check of the University libraries, and Interlibrary Loan turned up no copies of these texts, I happily purchased both volumes from the BCCA today. From the BCCA site, I rapidly found my way to Dan Morean’s Breweriana.com, a site that specializes in the sale of collectable beer cans and other beer ephemera. In addition to the quite extensive catalogue of cans (with photographs) listed on the site, it includes a number of resources for the new collector, including a guide for dating cans, a taxonomy of the types of cans, and a guide for the “grading” of the quality of collectable cans. Fascinated, I found that not only has the site been operating since 1996, it also has a brick and mortar location in Brimfield, Massachusetts, about an hour and a half outside of Boston, with a 5000 square foot showroom. Needless to say, this is now on my list of places to visit the next time I make my way up to that area. This is not a unique path in research by any means. Often, the academic may overlook the existence of the collector simply due to lack of knowledge or awareness. It never occurred to me that there would be a national organization dedicated to the collecting of beer cans. 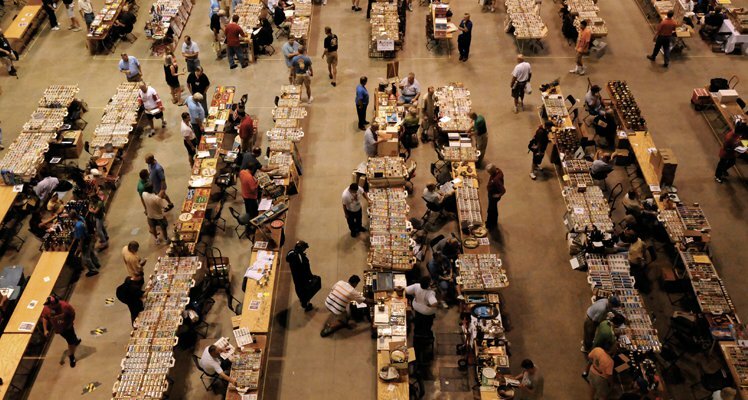 Now, I find myself fascinated by the images of huge convention space floors filled with can traders and collectors, feeling a resonance with the time I was very much a comic book collector. There is a hidden world in every organization like this that I have stumbled upon, a network of people with knowledge so narrowly specialized, yet deep in detail, often happy to teach anyone that shares their passion. To ignore it is to reject the tradition of the collector, that tradition which spawned the modern museum, and it is at the peril of the historian to do so.